Are your floors starting to deteriorate? Maybe they just aren’t your style anymore. Whatever the case may be, visit our showroom to find a huge selection of replacement flooring. We offer a wide range of styles and materials, but one of our most popular is our luxury vinyl flooring. Many of our customers are surprised by the beauty, durability, and designed versatility offered by vinyl because they remember the way this material used to be made. A lot has changed in just a few years. With advances in the manufacturing technology, vinyl sheet flooring can be made to mimic virtually any hard-surfaced flooring material. It’s also much more wear-resistant than it was just a decade ago. But don’t take our word for it—stop into our showroom to see for yourself. When you visit our store, you’ll see a vast amount of high-quality products ready to be placed in your home. But we don’t let you feel overwhelmed by the decisions ahead of you. Instead, we work with you throughout the whole process to find the vinyl tile flooring that works best for you. From selection to installation, our team focuses on meeting your goals and exceeding your expectations. Impress anyone who walks through the doors of your home or business. One of the greatest advantages to choosing vinyl flooring is the instant aesthetic change your space encounters. From faded laminate or cracked tile to a stunning, timeless vinyl floor, you and your guests will notice a remarkable difference. Vinyl is a versatile material that offers more than just looks. Because of the way it is made, it has design flexibility that’s hard to beat. It can mimic not only the look, but also the texture of materials like hardwood and natural stone. But it also has a multi-layer construction that gives it a slight bit of cushion. This is great for rooms like the kitchen where you are on your feet much more than you are sitting down. And with a range of colors, patterns, and textures, you’re bound to find something you adore. 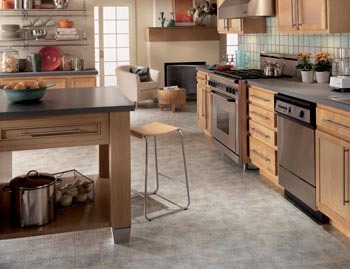 Our luxury vinyl tile flooring starts at $3.49 per square foot. The same layers that provide extra comfort also make vinyl tile flooring resistant to wear, moisture, and stains. This material won’t warp from excessive moisture and won’t soak in liquids. The natural moisture-resistance of vinyl makes it a cleaner and more easily maintained flooring choice. Find inspiration for your new project by browsing through our inventory. While you may not know exactly what you want, there’s no time like the present to start getting ideas. The best way to do that is by working with our vinyl flooring specialists. When you step into our showroom, you are greeted by sales and design professionals eager to help you choose the perfect product for your home or business. You may look around at your leisure or consult with us for faster results. Our professionals talk with you about your lifestyle, personal preferences, budget, and any specific needs you have for your new vinyl flooring. Then, we show you samples that meet your wants and needs until you find your ideal match. To make sure you are completely confident about your final decision, our design team shows you what your selection would look like in your space. This shows you if it’s too light or dark, or if the pattern is too busy for the size of your space. We can always make the appropriate adjustments before we begin installation. Whether you choose vinyl plank flooring that looks like real hardwood or vinyl tile that mimics natural stone, you get a product that is made to last. We offer top name brands like Armstrong, Downs, Mannington, and PurSTONE, giving you even more confidence that you’re making the right decision for your space. If you’re like some other homeowners, you want as much hardwood in your living space as possible. But while the warmth and beauty of hardwood cannot be denied, its use in spaces like kitchens and bathrooms is extremely limited. That’s because they have a permeable surface not well-suited to moist environments or rooms prone to spilling. High moisture and humidity causes warping over time and the small crevices harbor liquid and bacteria that can lead to mold growth. There is a solution, however. Our vinyl plank flooring gives you the same look as solid wood floors, but has all the advantages of vinyl. With several non-porous layers in its design, there’s nowhere for liquid to seep into. Instead, it sits on top of the surface just waiting to be wiped up. This not only reduces your chances of mold growth, but also helps ease the burden of cleaning and maintaining your floors. The design versatility of vinyl flooring is a huge advantage in these situations as well. Because it comes in a large spectrum of colors and grain patterns, you can find vinyl plank that matches your existing hardwood floors. This creates that seamless solid wood look you desire. Don’t ruin your investment by getting a less experienced contractor to install your new floors. When you take advantage of our vinyl flooring installation services, you get true experienced professionals who use efficient techniques so you have beautiful, long-lasting floors in no time. When you come to us for your installation, you walk away with a promise. If your newly installed floors ever have an installation-related problem, we’ll fix it—you don’t even have to worry about the costs. With this Lifetime Installation Guarantee, you can rest assured that your vinyl flooring will maintain its stunning looks and incredible resiliency for years to come. Contact our flooring store today for more information about our luxury vinyl tile options. We proudly serve the communities of Okemos, East Lansing, Holt, Haslett, Lansing, Mason, Williamson and Haslett, Michigan.